IN 1945 the Allies bombed the German city of Desden. In four raids between 13 and 15 February 1945, British Royal Air Force (RAF) and United States Army Air Forces (USAAF) dropped more than 3,900 tons of high-explosive bombs and incendiary devices on the city. The bombing and the resulting firestorm destroyed over 6.5 km2 of Dresden, resulting in the deaths of between 22,700 and 25,000 people. In August of 2014 the Israel Defense Force (IDF) bombed Gaza City, toppling the 15-storey Basha Tower and destroying a power plant and infrastructure. Some 2000 Gazans including women and children were killed in the conflict sparked by Hamas missile attacks against Israel in an escalation of violence caused by the kidnapping of three Israeli seminary students. Israel is guilty of ethnic cleansing, genocide and worse, promoting, “permissible genocide”. Far be it for me to support either of these tragic positions, articulated in the above two examples: War is not the solution to human problems. Nelson Mandela showed South Africans and the world that dialogue and listening to the other person’s point of view, are far better weapons in the struggle for human rights. It is thus with a sense of moral outrage and indignation at the rapid loss of Mandela’s unique perspective and the problem of equivocation on Dresden (why is the Holocaust considered a Genocide but the fire-bombing of German cities doesn’t rate?) and also concern for the consequences for world peace if we fail to learn from history and fail to debate such issues– that I raise some uncomfortable facts regarding the Axis forces responsible for the extermination of 6 million Jews, and the ethnic cleansing of Jewish Palestinians under Hitler’s Final Solution. Pilger in a polemic piece published by the Sunday Times, claims to raise the problem of Ben Gurion’s Plan D and the Siege of Jerusalem which resulted in the displacement of people on either side to the conflict during the Israeli War of Independence, In doing so, he painfully ignores the problem of Nazi atrocities committed in Jerusalem under the rule of Haj Amin al-Husseini. During World War II al-Husseini collaborated with both Nazi Germany and Fascist Italy, recruiting Muslims for the Waffen-SS and sending some 100 000 Jerusalem Jews to gas chambers in the Ukraine. Encouraged by his meeting with the Italian leader, al-Husseini prepared a draft declaration, affirming the Axis support for the Arabs on 3 November. In three days, the declaration, slightly amended by the Italian foreign ministry, received the formal approval of Mussolini and was forwarded to the German embassy in Rome. On 6 November, al-Husseini arrived in Berlin, where he discussed the text of his declaration with Ernst von Weizsäcker and other German officials. In the final draft, which differed only marginally from al-Husseini’s original proposal, the Axis powers declared their readiness to approve the elimination (Beseitigung) of the Jewish National Home in Palestine. Haj Amin al-Husseini meeting with Adolf Hitler (December 1941). On 20 November, al-Husseini met the German Foreign Minister Joachim von Ribbentrop and was officially received by Adolf Hitler on 28 November. He asked Adolf Hitler for a public declaration that ‘recognized and sympathized with the Arab struggles for independence and liberation, and that would support the elimination of a national Jewish homeland’. At the time of the opening of the Islamic Central Institute, there were an estimated 3,000 Muslims in Germany, including 400 German converts. 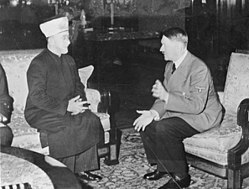 The Islamic Central Institute gave the Muslims in Germany institutional ties to the ‘Third Reich’ thus securing Nazi support for the Arab league. In the propaganda war being waged by both sides, it is important to note the issue of proportionality. Clearly, as Pilger demonstrates, the use of emotive terms such as “Genocide” and “Ethnic Cleansing” fail to take into account the historical legacy of Arab support for Hitler’s Final Solution and the responsibility which Arab Palestinians must bear in their support of the extermination of Jews. Our freedom is not complete without the freedom of the Palestinians according to Mandela, and as a secularist he would also have added: this freedom is meaningless if it fails to include Judaism, Islam and Christianity.